Henry initially contacted me to find out which ElliptiGO model would best suit him – concerned at the cost of the range-topping ElliptiGO 11R, but adamant that he needed an outlet for his hard-training competitive nature (meaning that he wanted an ElliptiGO that would allow him to ride with road cyclists and even to race against them). I gave him the ‘bad’ news that only the 11R ElliptiGO model could facilitate those ambitions – but I also told him that it would take him a few months of adaptation to ElliptiGO training before even an accomplished athlete such as himself could aspire to train alongside road cyclists, let alone race them. I must admit, I never thought it possible for Henry to become a runner again. Indeed, I actively discouraged it, because I thought it was too risky (with the seriousness of his ankle condition at the time). But Henry had seen the story of a competitive American runner called Simon Guitierrez, who had a similar condition to the one which was crippling Henry at the time we had met. Simon had turned to ElliptiGO training to help him recover from the condition and he eventually resumed competitive racing as a successful national-level Masters athlete. Henry’s ElliptiGO training journey has been an exciting and interesting one for me to watch unfolding over the years and I thought it would be a great one to share in the first ElliptiGO newsletter of 2018. I think his story can inspire all of us to resolutely have faith in ourselves, faith in our own intellect, and faith in the power of the human spirit. Here’s the discussion I had with Henry about his training journey, so far. I hope you find it as interesting and as uplifting as I have. Q. When did you start training on the ElliptiGO – and which ElliptiGO models do you use? I started training on an ElliptiGO 11R in August 2014. In April 2017 I got an ElliptiGO Arc 24 and have trained on both bikes since then. Q. How did you first learn about the ElliptiGO and what made you think this bike would actually be a solution to your particular set of personal circumstances? I first learnt about ElliptiGO from a promotion in a running magazine, about Meb Keflezighi (I think). At the time I wasn’t injured, but I took note. When I became injured in early 2014, and knew that I was going to be off running long-term, I tried cycling and swimming to maintain fitness, but found that these activities didn’t maintain the same level of aerobic fitness (or give me the same satisfaction) as running. I wanted a more running-specific solution that also enabled me to exercise outside. The ElliptiGO was the only choice! Q. I know you always told me you’d become a runner again (after a few years of rehabbing your ankle on the ElliptiGO). I admit that I didn’t believe you could do it at the time (and, indeed, that I actively discouraged you from pursuing that goal). Please explain the nature of your medical condition, the advice your medics had given you, and why you’d felt this goal you had of becoming a runner again would be achievable? I had been running competitively over middle and long distances from my early teens, with limited injuries during this time. In late 2013 I developed swelling on the outside of my left ankle, but it was not inhibiting or painful, so I carried on as normal. In early 2014 the problem became more inhibiting, causing some pain and limiting range of movement, and peroneal tendonitis was diagnosed by my physiotherapist. After treatment and rest the symptoms didn’t improve so I had MRI and CT scans which showed avascular necrosis of the talus bone – a serious condition that is difficult to treat and normally leads to further bone degeneration, collapse of the joint and pain. All the advice I was receiving at this time, from multiple specialists, was to fix the problem with surgery (bone drilling, joint fusion, joint replacement) before the necrosis got worse, but all options gave uncertain outcomes for a return to normal activity. This did not seem like a good deal to me. I knew that I was going to be off running for a while, but I refused to believe that I would never run properly again. I chose to ‘wait and see’ and to try to promote healing by keeping as fit and healthy as possible – and it’s at this point that I got into ElliptiGO riding. Also, I had great support from other athletes I knew who had gone through career threatening injuries, only to return to competition, and this gave me belief that I was doing the right thing. Over the last year I have been treated with a programme of PRP (Platelet Rich Plasma) injections into my ankle joint, by a specialist at the London Independant Hospital. This treatment has helped improve functionality, and may have improved the condition, although subsequent scans have been inconclusive. Q. How long was your layoff from running at the time you first bought the ElliptiGO? And how long did it take to get to where you are now (running successive 6-minute-miles on your regular outings and even doing long runs and interval sessions)? I was off running for about 4 months before I bought the ElliptiGO, in August 2014. So it has taken over 3 years to get to where I am now, including heavy ElliptiGO training most of this time, combined with club swimming sessions and very gently building up the running frequency and quality in the last 10 months. Q. What was your training week like in the years during which you didn’t run at all – and what is your training week like now that you run again? For a few years, I only trained on the ElliptiGO. It was fairly unstructured, as my aim was to have fun and keep fit. A typical week would involve some long rides, easy rides of 30-50 miles, and a few shorter harder rides with sport cyclists of 20-30 miles, or hill repetitions. I also took part in organsied rides – such as Sportive and Audax events over longer distances (on the ElliptiGO). In 2016 I combined this with hard swim training sessions, with a triathlon club, twice a week. Now I run up to 4 times a week, including a steady long run of up to 10 miles, hard intervals (hills, short or long reps) and a tempo run (or race) over 3-5 miles. On non-running days I’ll do a steady ElliptiGO ride or HIIT (high intensity interval training) session. Q. Be honest – does this return to running feel sustainable for the long term? Do you feel any specific fragility relating to your previous condition? Yes, it’s definitely sustainable! With careful management, sensible training balance, and listening to my body. My left ankle is of course not as robust as pre-injury, but I don’t plan to run heavy mileage on it. However, much of the weakness I have experienced has been due to calf muscle atrophy and ligament weakness (caused by wearing a strong brace for a long time – a bad idea in hindsight), and that takes a long time to re-build. Q. Do you have specific running-related goals, or are you just happy to be indulging in your lifelong favourite activity again? First of all, I am immensely greatful and appreciative of being able to just enjoy running again. My fiancee is a runner and when we met I was still injured – it’s a gift to be able to run together now. Although I believed I would run well again, it’s been a long road, with some setbacks in my faith. 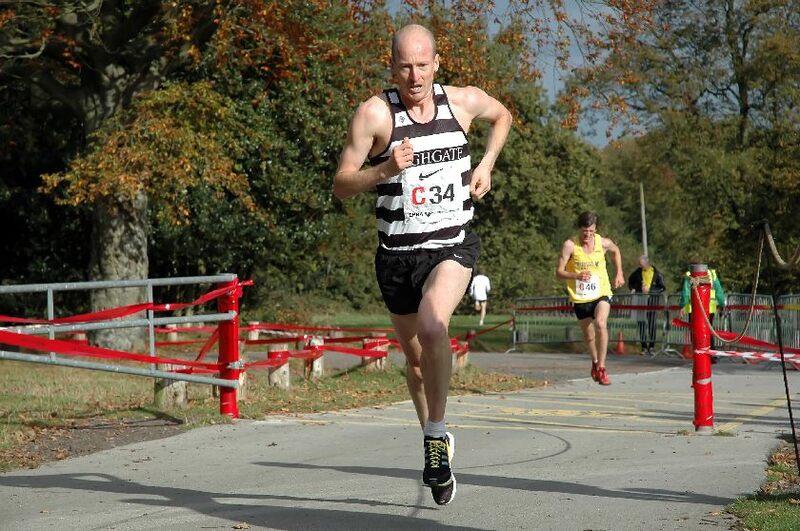 My aims are to simply enjoy competing again, with my new club (Runnymede Runners). I’m also targeting a few club records and I want to become a ‘running tourist’ again! Q. What is your favourite running training session like? I most enjoy off-road hill reps, actually! Q. What is your favourite ElliptiGO training session like? Riding with the hordes of sport cyclists round the Regents Park 3 mile circuit in London, early in the morning. Q. Do you have a preferred ElliptiGO model? If so, why? I have an Arc 24 and an 11R, and I like both equally. They are both different in the type of workout you get – and the ride. Q. What have you learned about ElliptiGO training that you never expected to learn? ElliptiGO training is great for developing incredible hamstring and glute strength. And the ‘runners high’ you experience after riding a hard session. Q. Which aspects of the whole ElliptiGO experience have surprised you the most? The inspiring stories and camaraderie of the other ElliptiGO riders I have met on long-distance challenges and through working with ElliptiGO. These people all have different reasons for getting into ElliptiGO riding, but all have gained positively through the experience. Q. If you had to chose just one – ElliptiGO or running – which would it be (and why)? Q. You’ve been a top-level club runner Henry, what are your proudest running achievements? My best achievements are winning various regional and national team trophies with Highgate Harriers (Henry’s London running club), but perhaps more memorable are the runs I’ve done in amazing places around the world – such as in Perth, Cape Town, Luanda, Boulder, Singapore and Houston. Q. You are also one of the top ElliptiGO riders I know, in many ways. What are your proudest achievements on the ElliptiGO? Probably the toughest ElliptiGO challenge I have completed was the Double Dunwich Dynamo ride we did in 2015 (an annual semi-organised overnight bike ride from Central London to Dunwich, on the Suffolk coast, covering a total distance of around 225-miles to achieve the ‘Double’). I did the event with an ElliptiGO team of 4 riders, but without any transport plans to get back from Dunwich. We arrived in Dunwich at 6am, with the bulk of cyclists, enjoyed the scene – and then rode back to London to achieve the double. The poor weather, distance and lack of sleep on the return, were a real test for me – but the team effort got us through. Q. If you could go back in time, what would you do differently as a runner? Be less focused on mileage and cross-train more (ElliptiGO and HIIT sessions). Q. You are well known in London running club circles, having been President of Highgate Harriers, one of the leading competitive running clubs in London. But you’ve expressed a frustration at the lack of understanding and uptake of ElliptiGO training among the competitive running ‘crowd’ in your club. Why do you think this is? And if you had a ‘forum’ to explain to competitive runners why you feel they should use the ElliptiGO as a staple in their training, what would you tell them? This is true – most of the people I used to train and race with all over north London now know about the ElliptiGO and it’s training benefits, and I was a common sight in London riding around on my ElliptiGO. I think the main reasons for the lack of uptake is cost and limited precedent in the UK – visible examples of athletes that are winning by incorporating the ElliptiGO into their training. It needs to be obvious and proven to the running community here that cross-training on an ElliptiGO works for preventing injury, boosting aerobic fitness and running-specific strength (whilst being tremendous fun to do). Recently, I got my fiancee (a runner and cyclist) into ElliptiGO cross-training and you can read about this in this blog post she wrote about her experiences. Q. What do you think the future of running training will look like, in 20 years time Henry, when you & I are old & grey (and telling our war stories to anyone who’ll listen)? I hope that we’ll see a move to more savvy training methods, such as incorporating more off-road running and effective, running-specific cross-training methods, enabling athletes to be stronger, less-injury prone, more rounded and therefore more consistent over many years. Q. You are an avid bike rider as well as a runner Henry – please list all the bikes you own, what each one does for you and which are your favourites – in descending order. I know it’s a bit like ranking your children, but I’ve got to do what I have to do – and so do you! Apart from the ElliptiGOs, which are by far the most fun-to-ride bikes I know, the Brompton (folding bike) is great around town and I occasionally ride a BMC road bike (but after an initial hour of being amazed at the speed, lightness and smoothness, I get bored and sore quickly on this one)! Q. Is there anything else you’d like to share, Henry? I’d like to thank various people for their support and help over this time: Ben Pochee and Nina Anderson (Highgate Harriers); Idai Makaya (ElliptiGO team); Dr. Nat Padhiar, Consultant Podiatrist, and team at the London Independent Hospital; all the great people at Highgate Harriers,Tri London and Runnymede Runners; and Jean Knapp (my fiancee).